Work: Delegate to the Continental Congress, 1775, Appointed Special Commissioner of Finance, 1776; Author of the plan for a National Bank, 1781; Financial Agent of the United States, 1781; Delegate to the Pennsylvania Legislature, ca. 1783; Delegate to the Constitutional Convention, 1787; United States Senator, 1789-95; Appointed Secretary of the Treasury, 1789. Born in England in 1734, he came to the Chesapeake Bay in 1744 and attended school in Philadelphia. Young Robert, who seemed ill suited to formal education and too quick for his teacher in any case, was soon apprenticed to the counting room of Charles Willing at the age of 16. Two years later his employer died and Morris entered a partnership with the gentleman's son. In the succeeding thirty nine years that business flourished, and Robert Morris' wealth and reputation were secured. Being an importer, the business was hit hard by the Stamp Act and the colonial revolt against it. Morris and his partner choose the side of the colonials and Robert engaged in the movements against British rule. Elected to the Continental Congress in 1775, he participated on many of the committees involved in raising capital and provisions for the Continental Army. Early in 1776, he was given a special commission by congress, with authority to negotiate bills of exchange for, and to solicit money by other means for the operation of the war. One of the most successful such devices were the lotteries. 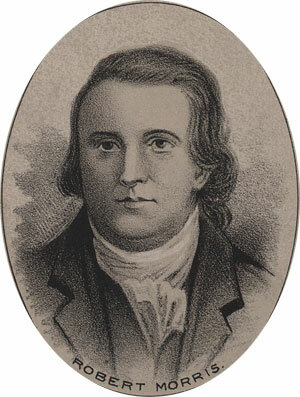 In late 1776, with the Continental Army in a state of severe deprivation because of a shortage of capital and the failure of several of the colonies in paying for the war, Morris loaned $10,000 of his own money to the government. This money provisioned the desperate troops, who went on to win the Battle of Trenton (Washington Crossing). Throughout the war he personally underwrote the operations of privateers, ships that ran the British Blockades at great risk and thus brought needed supplies and capital into the colonies. Following the war, he served in the Pennsylvania Legislature. He was also a delegate to the Constitutional Convention in 1787, and thereafter an advocate for the new constitution. He was then sent as a Senator for Pennsylvania when that constitution was ratified. In 1789, President George Washington appointed Morris Secretary of the Treasury, but he declined the office and suggested Alexander Hamilton instead. Morris completed his office as Senator and then retired from public service. He never recovered the wealth that he enjoyed before the revolution. What was left of his fortune was soon lost to land speculation in the western part of New York state. He died in 1806, in relative poverty, at the age of 73.